(Phys.org) —A team of researchers at the University of California, Berkeley, is proposing a possible way to measure gravity's impact on antimatter atoms. In their paper published in Physical Review Letters, the team describes how a procedure using an interferometer and super-cooled antihydrogen atoms could theoretically reveal how antimatter reacts to the force of gravity. Because antimatter is so scarce, little is known about its properties, including whether it responds to gravity in the same way as matter. In principle, testing whether antimatter responds the same way as everyday matter should be relatively straight forward—drop some of it and see if it falls down, or up, or does neither. That hasn't happened yet for two reasons. The first is that antimatter is extremely rare—gathering enough to form a clump to drop has been impossible. The second reason is that antimatter is annihilated when coming into contact with matter, making it extremely difficult to collect, hold and perform experiments on. In this new effort the research team believes it has found a way to overcome both problems with an experiment that should reveal for the first time, how antimatter atoms respond to gravity. The teams' idea is to use antihydrogen atoms such as those produced at CERN (a team there is able to produce antihydrogen atoms at a pace of one every fifteen minutes). The antimatter atoms would be chilled to one degree above absolute zero then herded to an interferometer using light. Because of the extreme cold, the antimatter atoms' behavior would change to resemble that of waves, rather than particles—by noting how the waves interact with one another, their reaction to the force of gravity could be measured. Because they would have so few antihydrogen atoms to work with, the team suggests magnets could be used to corral the atoms inside the interferometer, allowing for measuring each many times rather than measuring many atoms just once each. They also propose that their scheme should allow for measuring the impact of gravity on antihydrogen atoms to approximately 1 percent accuracy at the onset, but subsequent tweaking should improve that 10,000 times over. Gaining a better understanding of the impact of gravity on antimatter could provide not only a better understanding of such material, but perhaps could also provide some new insights into the nature of gravity, which after years of study, is still mostly a mystery. Because of the extreme cold, the antimatter atoms' behavior would change to resemble that of waves, rather than particles—by noting how the waves interact with one another, their reaction to the force of gravity could be measured. Something I have never considered. Are the force particles made of matter or anti-matter? Or is the question meaningless? Gluons for instance? I think generally the bosons are their own anti-particle. For bosons (the force particles, you are referring to) this simply depends on elementary (electric) charge, and since most have a charge of 0 then they are their own antiparticles. The W- boson has a charge of -1, though, so it has an antiparticle, W(plus). The Zwentoo is also of ambivalent nature until it interacts with other posters. It then collapses to a state that carries an intrinsic negative charge. Particles being their own antiparticles accounts for how much on the balance sheet to balance the accounts of matter and antimatter? 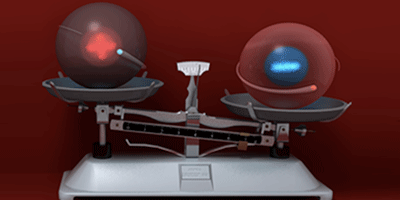 How much in the red is antimatter? How much is accounted for from particles being their own antiparticle? These questions come from me - an interested bystander.